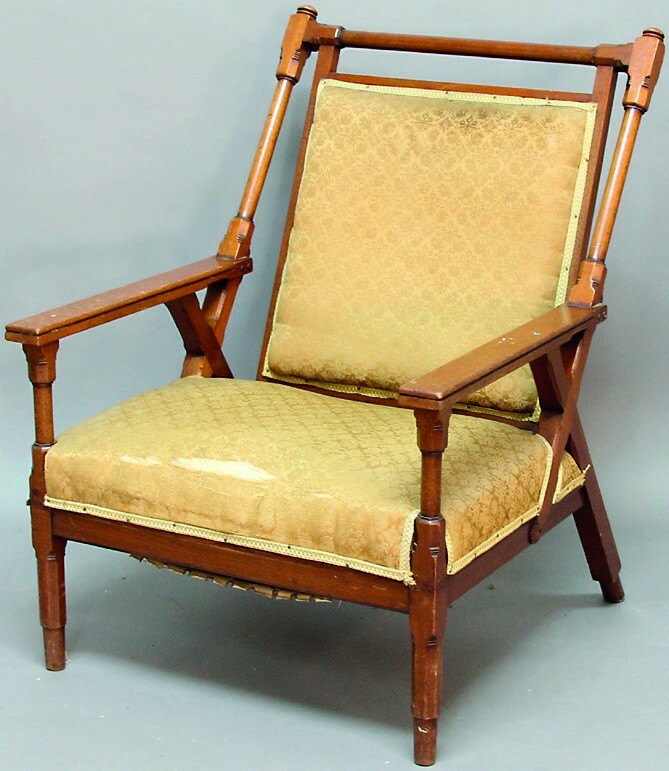 This Aesthetic movement X-frame armchair took £11,000 against an estimate of just £100-150 at Lawrences of Crewkerne. An Aesthetic movement X-frame armchair designed by Christopher Dresser for the Art Furnishers’ Alliance. Offered at Lawrences of Crewkerne, it sold to a dealer at £11,000. As referenced in the catalogue description, the polished deal chair is in the manner of Victorian designer Christopher Dresser. In fact, a near-identical chair formed part of the Dresser retrospective held at the Cooper-Hewitt museum, New York, in 2004. It was probably made c.1880 as part of the Art Furnishers’ Alliance project that united like-minded manufacturers, including Hukin & Heath, Benham & Froud and William Cooke, with the aim of providing “whatever is necessary to complete artistic furnishing of a house”. Businessman George Hayter Chubb (of lock and safe fame) was appointed chairman and Dresser the ‘art manager’. The Alliance operated from a Mayfair shop for three years until 1883, when the company went into liquidation and the stock was sold at auction. Art Furnishers’ Alliance furniture was manufactured by the cabinetmaking firm Thomas Knight of Bath. Sometimes more avant-garde than Dresser’s other furniture designs, it nonetheless shares common characteristics, particularly the mixing of Japanese, Egyptian, Greek and Gothic styles. Lawrences’ chair sold at the auction on January 18 to a UK dealer against a European underbidder and other UK private collectors on the phone. A 22% buyer’s premium was charged.